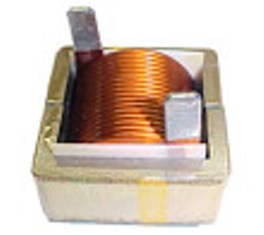 HN, KN and GN Series of Nanocrystalline Common Mode Choke and Amorphous Common Mode Choke (CMC). These 3 Series are wound on nanocrystalline and amorphous ribbon cores. The cores are epoxy potted and encased in high temperature plastic casing to provide mechanical integrity and can survive drop test. Nanocrystalline and amorphous ribbon wound cores are very fragile and breaks easily without encapsulation. 2) Very high inductance (L), impedance |Z| and insertion loss (-dB). Compared to ferrite CMC of the same size, the L can be over 4x higher at 10Khz and 2x higher at 100 Khz. Therefore smaller size can be used to achieve the same insertion loss. 6) Little or No magnetostriction allowing low audio noise operation and allowing the cores to be potted and encapsulated for mechanical strength.